Focusing on the rubble that now sadly exists, Le stacks images one on top of another like rocks to further make his point and allow the viewer to fully appreciate the imagery on view. 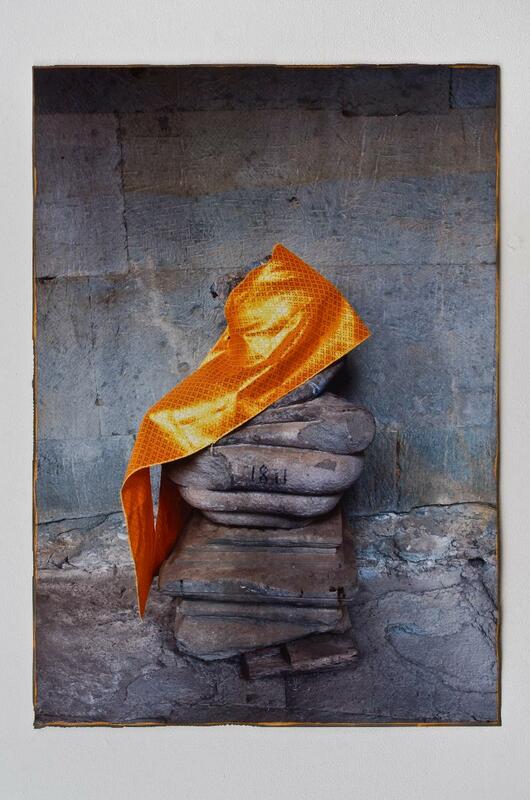 Laced within the photographs of the temples are images of Cambodian citizens who were killed by the Khmer Rouge. Onlookers are encouraged to search for the significance in the photo montage presented in Le's meticulous effort. Le also explored Sumer, now known as present-day Iraq. Not much is left from this civilization but the Sumerians are identified as being one of the first contributors to the written word. 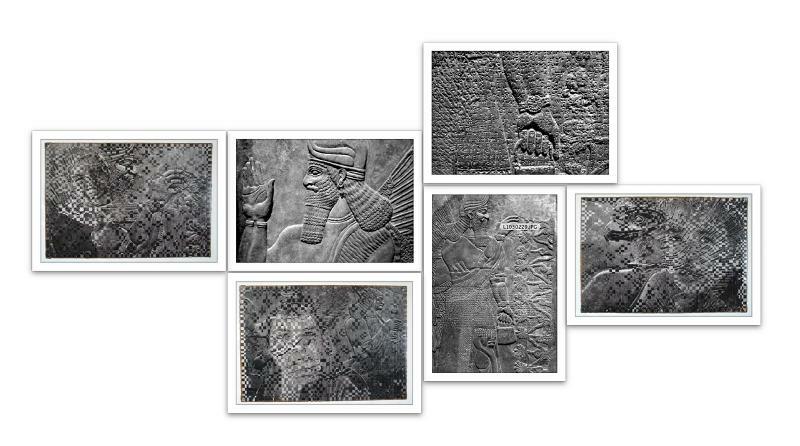 With images taken from the Internet as well as from museum artifacts and archives, Le used portraits of these highly civilized people and "wove" them with relics from the Sumerian society. 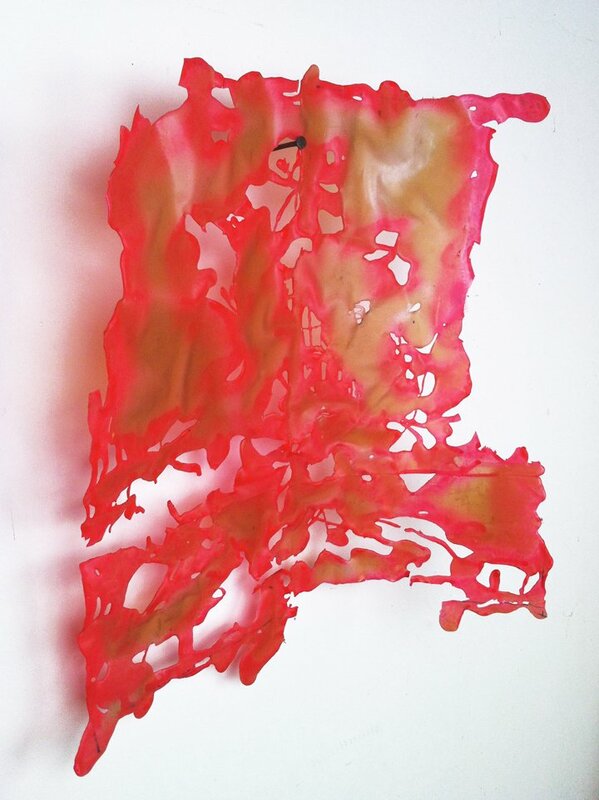 Dinh Q le has exhibited nationally and internationally at the Venice Biennale, Museum of Modern Art in New York, Hayward Gallery in London, the SFMoMA, and the Museum of Fine Arts in Houston, among many others. 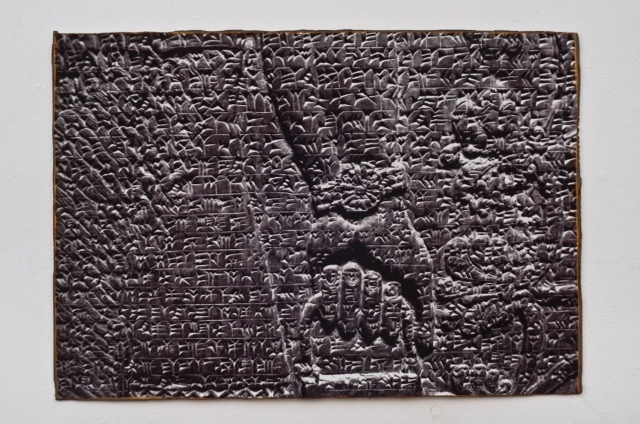 Remnants, Ruins, Civilization and Empire is on view through July 14 at the Shoshana Wayne Gallery in Santa Monica, CA. Another talented photographer will be showcasing commissioned work that originally appeared in the December 2011 issue of Vogue magazine. 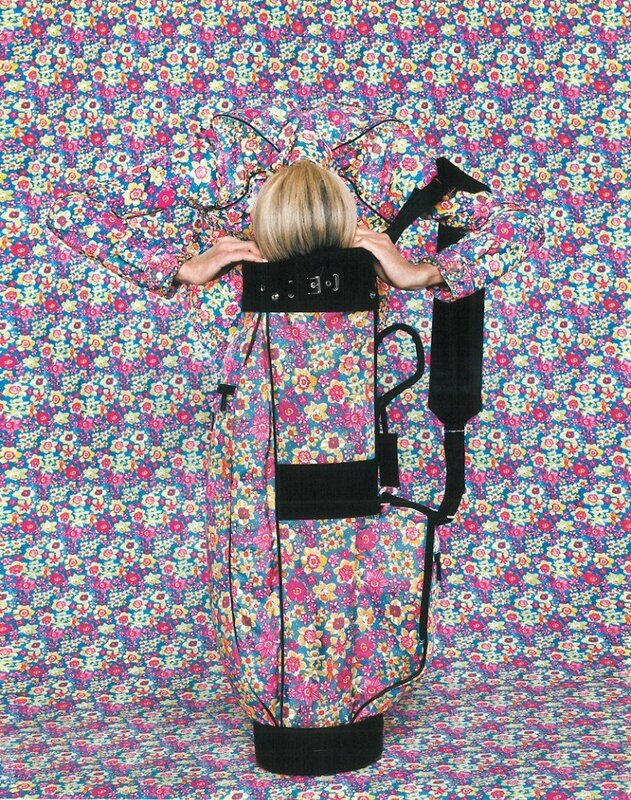 Related to her "Lost in My Life" series, Rachel Perry Welty uses patterns designed by top clothing labels, such as Prada, Givenchy and Balenciaga, in her whimsically staged self-portraits. Welty has been commenting on what she calls the "business of living" by immersing herself in ordinary daily discard: price tags, fruit stickers, receipts, twist ties. In "The Vogue Pictures", Welty is using someone else's excess material and a team of assistants to conceptualize the extravagance of a fashion magazine spread. In Vogue (Prada), Welty has created a floral wall and floor covering using the pattern of the designer's new spring golf bag. Welty barely reveals herself in the photograph as she hides her head. 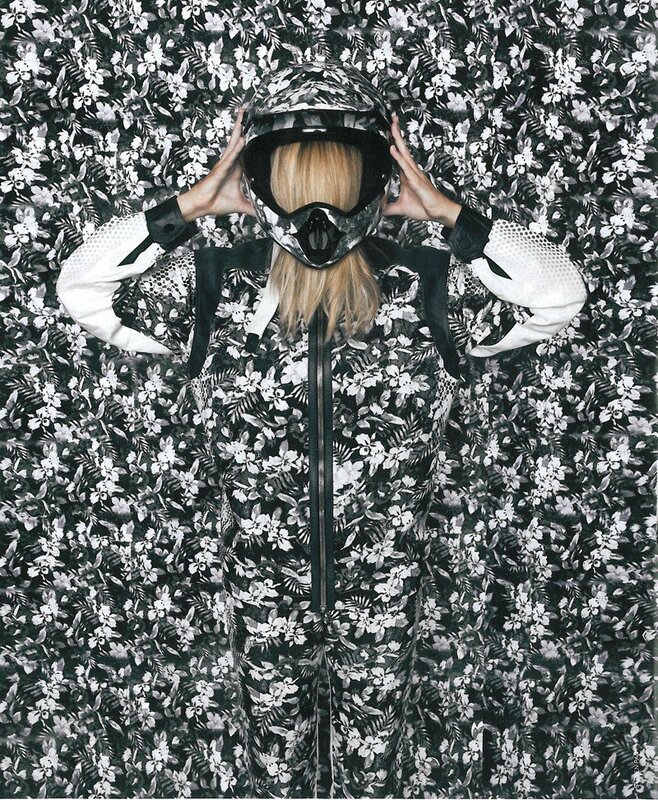 The designer's jacket, the artist's hair and her hands are the only objects that distinguish her from the luxury brand's design. Born in Japan, Welty lives and works in Massachusetts. 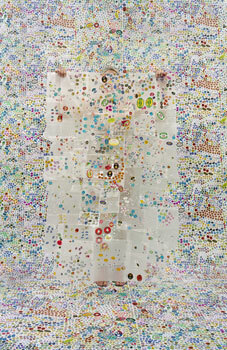 Her work has been exhibited at the Museum of Fine Arts in Boston, The Drawing Center in New York and the DeCordova Museum and Sculpture Park. The Vogue Pictures are on view through July 6 at Yancey Richardson Gallery in New York City. 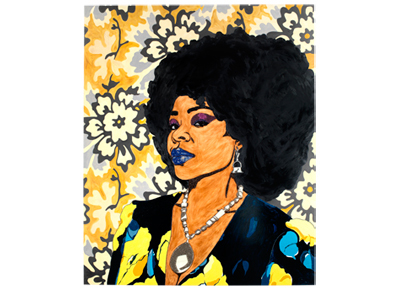 Known for her elaborate paintings adorned with rhinestones, enamel and colorful acrylic, Mickalene Thomas continues to explore notions of African-American female identity. In her first solo museum exhibition, Thomas examines the relationship of the female figure to both interior and exterior environments in her works, using kitschy decorative patterns inspired by her childhood. The painting style is actually reminiscent of pointillism with its jewel-encrusted surfaces and takes historical cues from Courbet, Matisse and Manet. Thomas draws us in by mixing 19th-century plein-air landscapes with modern-day interiors and portraits. 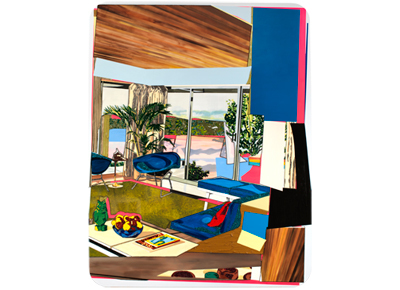 Mickalene Thomas's work is in the collections at the Guggenheim Museum in New York, the National Portrait Gallery, the Museum of Fine Arts in Boston and the Whitney Museum of American Art, to name a few. 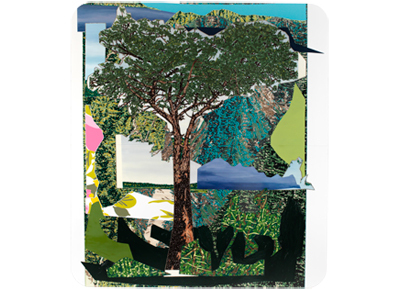 Mickalene Thomas: Origin of the Universe is on view at the Santa Monica Museum of Art through August 19 and then will travel to the Brooklyn Museum from September 27 until January 30, 2013. Yi, Dos, Drei, Four is an exhibition featuring new works by Omar Chacon, Lisa Chou, Ati Maier and Jose Sarinana, that celebrates their diverse heritages from Colombia, Taiwan, Germany and Mexico. 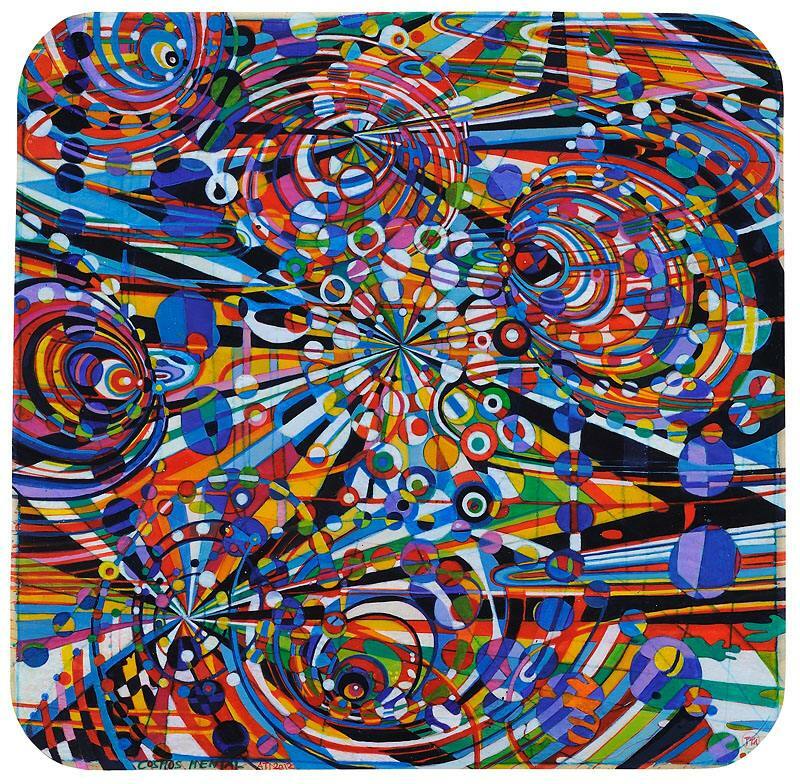 Highlights include Chacon's candy-colored acrylic paintings, both on paper and on canvas. 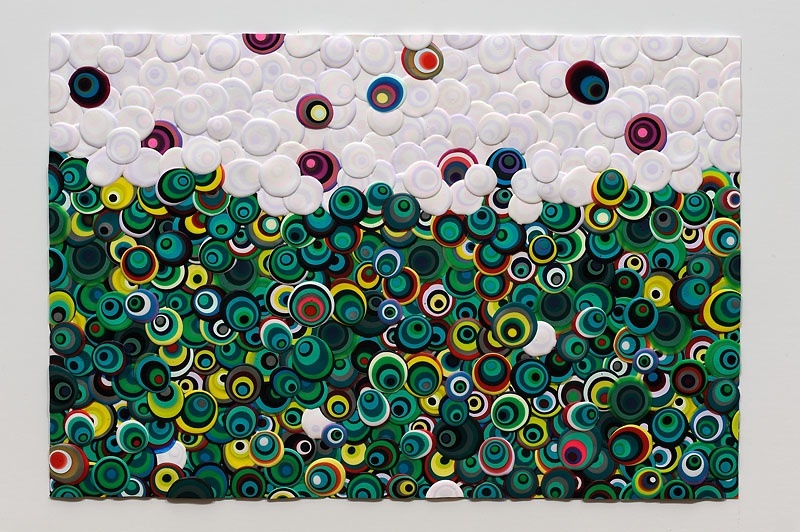 Lisa Chou's new leather collages on wood are inspired by random visual elements she encounters while traveling around New York City, where she currently lives. Maier's new ink on paper paintings and 3D animated videos continue her exploration into cosmic-like landscapes. 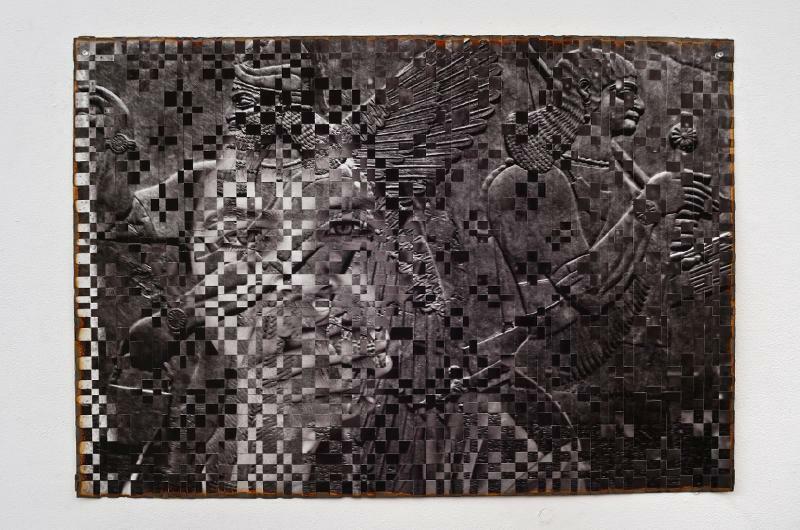 Lastly, Jose Sarinana's most recent multi-media assemblages are presented, which he creates when he is not making Pho beef tacos at his Vietnamese restaurant, Xoia, in Echo Park, CA. 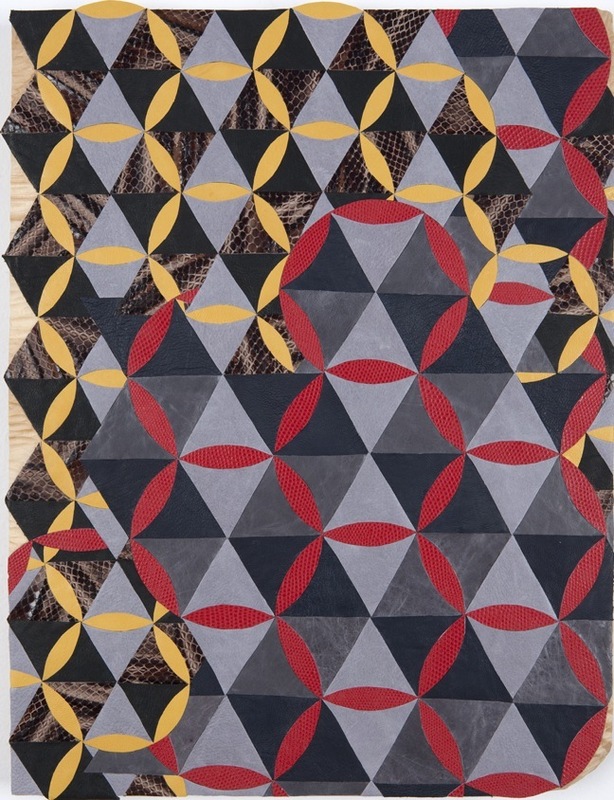 Works by these internationally recognized artists are on view at Fouladi Projects in San Francisco through July 14. As a tribute to the late Cy Twombly, Gagosian Gallery presents his last paintings and 100 of his photographs ranging from early studio impressions from the 1950s to a group of landscape subjects taken in St. Barth's last year. The eight, bold and colorful paintings on view exemplify the freedom with which Twombly typically worked. Twombly remains one of the world's most admired contemporary artists, whose ongoing relevance can be witnessed by the surge of recent survey exhibitions in leading institutions. Cy Twombly was born in Lexington, VA in 1928 and died last year in Rome, Italy. These last paintings and lesser-known photographs are on view at Gagosian Gallery in Beverly Hills through June 9. All titles are produced in just one edition of eight, regardless of size. Each individual edition number has a unique detail added by Rauzier. 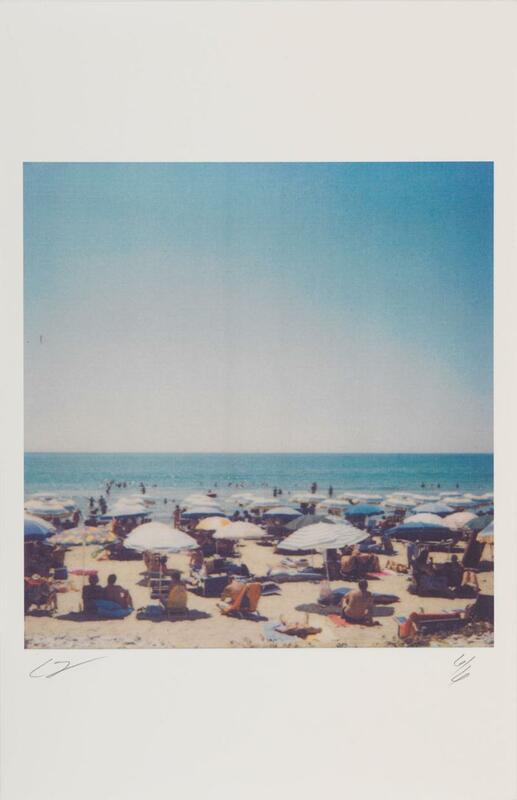 All works are C-type prints, archivally mounted behind UV-protective plexiglass or framed. Slight size variations may be available, subject to the artist's consent.